Penn State University chemists and engineers have, for the first time, placed tiny synthetic motors inside live human cells in a lab, propelled them with ultrasonic waves, and steered them magnetically. KurzweilAI has covered a number of designs for microbots studies in laboratories (and one that uses a pill that is swallowed) that could one day be passively or actively propelled through the body, but the devices are not designed to penetrate cells. The Penn State nanomotors are the closest so far to a “Fantastic Voyage” concept (without the miniature people). The nanomotors, which are rocket-shaped gold rods ~300 nanometers in diameter and ~3 microns long, move around inside the cells, spinning and battering against the cell membrane. The nanomotors are activated by resonant ultrasound operating at ~4 MHz, and show axial propulsion as well as spinning. “As these nanomotors move around and bump into structures inside the cells, the live cells show internal mechanical responses that no one has seen before,” said Tom Mallouk, Evan Pugh Professor of Materials Chemistry and Physics at Penn State. “It may be possible to use synthetic nanomotors to study cell biology in new ways. We might be able to use nanomotors to treat cancer and other diseases by mechanically manipulating cells from the inside. The researchers’ findings will be published today (Feb. 10) in Angewandte Chemie International Edition. Chemically powered nanomotors first were developed ten years ago at Penn State by Mallouk and others. “Our first-generation motors required toxic fuels and they would not move in biological fluid, so we couldn’t study them in human cells,” Mallouk said. When Mallouk and French physicist Mauricio Hoyos discovered that nanomotors could be powered by ultrasonic waves, the door was open to studying the motors in living systems. For their experiments, the team uses HeLa cells, an immortal line of human cervical cancer cells that typically is used in research studies. These cells ingest the nanomotors, which then move around within the cell tissue, powered by ultrasonic waves. At low ultrasonic power, Mallouk explained, the nanomotors have little effect on the cells. But when the power is increased, the nanomotors spring into action, moving around and bumping into organelles — structures within a cell that perform specific functions. The nanomotors can act as battering rams to puncture the cell membrane or as egg beaters to essentially homogenize the cell’s contents. While ultrasound pulses control whether the nanomotors spin around or whether they move forward, the researchers can control the motors even further by steering them, using magnetic forces. Mallouk and his colleagues also found that the nanomotors can move autonomously — independently of one another — an ability that is important for future applications. Researchers at Weinberg Medical Physics in Maryland were also involved. The research was funded by the National Science Foundation, the National Institutes of Health, the Huck Innovative and Transformative Seed Fund (HITS) and Penn State University. 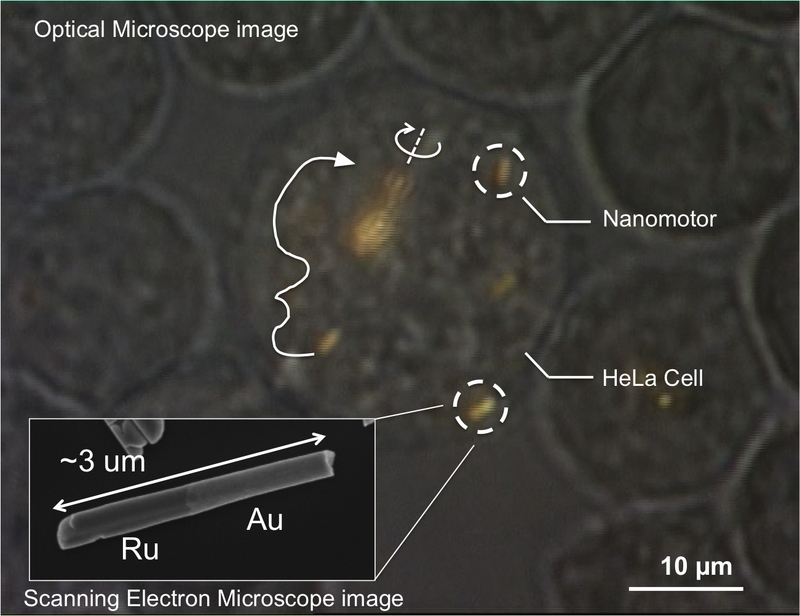 We demonstrate the ultrasonic propulsion of rod-shaped nanomotors inside living HeLa cells. These nanomotors (gold rods ~300 nm in diameter and ~3 µm long)attach strongly to the external surface of the cells, and are readily internalized by incubation withthe cells for periods longer than 24 h. Once inside the cells, the nanorod motors can be activated by resonant ultrasound operating at ~4 MHz, and show axial propulsion as well as spinning. The intracellular propulsion does not involve chemical fuels or high powerultrasound andthe HeLa cells remain viable. Ultrasonic propulsion of nanomotors may thus provide a new tool for probingthe response of living cells to internal mechanical excitation, for controllably manipulating intracellular organelles, and for biomedical applications.